Long hours, low wages and poor job security can make working in beer a stressful profession. James Beeson investigates the state of mental health in the industry. Today I watched someone attempt to take their own life. Looking up at a frightened, lonely man preparing to jump off an eight-storey building was a reminder of what a fragile and precious thing life is. Thankfully, on this occasion the emergency services managed to talk the troubled individual down from the ledge and prevented him from joining the thousands of young men each year who tragically see suicide as their only option. This particular individual probably doesn’t work in the beer industry. He probably doesn’t drink IPA, and it’s doubtful that he’s even heard of Cloudwater, Other Half and Mikkeller. However, the acute and very real mental health issues that likely contributed to him climbing up and being prepared to end his life will unfortunately be only too familiar to many of us that do work within the sector. From the outside, working in the beer industry probably seems like a dream job. After all, what could be better than a life spent making, selling, writing about or otherwise evangelising about beer, a vital social lubricant that makes the mundane banality of everyday life just about bearable? The reality, however, is often very different. From long days spent cleaning tanks and kegs, struggling to sell enough beer to pay the bills, and then having to read scathing, spiteful reviews online, the life of the brewer can often be a lonely and unhappy one. What’s more, employees of craft breweries are often poorly paid, overworked and hold less job security than many other professions. It’s not exactly a cocktail conducive to mental and emotional wellbeing. 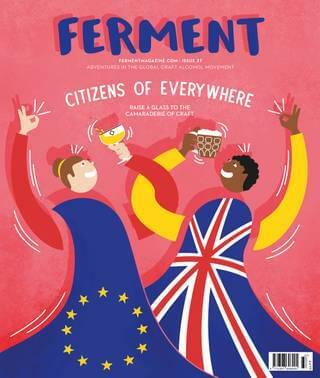 The pace of growth within the sector, combined with a lack of due care and attention to staff welfare can make brewing an incredibly stressful job, according to Fergus Gallagher, a brewer at Somserset’s Butcombe Brewery. Gallagher experienced mental health problems of his own last year, after moving to a rapidly growing company where he quickly found himself in a management position. Gallagher eventually sought therapy for his mental health problems, and moved away from the brewery in question to his current position at Butcombe. However, he is adamant the brewing industry still needs to be doing more to provide support to those who suffer from mental health conditions. “A lot of these new companies started in the past 10 years and are struggling in a densely populated market place,” he says. “But they need to pay closer attention to staff welfare. It’s not just about taking your staff out for a few drinks every now and then; it’s about one-on-one meetings and really getting to know your staff on a personal basis. Because of the very real stigma that still surrounds mental health issues, collecting statistics on the scale of the problem can be difficult. What is evident, however, is that one of the biggest contributing factors in many instances is the misuse of alcohol (the number of people admitted to hospitals with mental and behavioural disorders associated with alcohol use has risen by over 90 per cent in the past ten years according to Alcohol Concern). As a depressant, alcohol has the capacity to disrupt the balance of chemicals in our brain, affecting our thoughts, feelings and actions. It can lead to or exacerbate mental health problems such as anxiety and depression, disrupt sleeping patterns, damage the memory function of the brain and lead to impulsive actions such as self-harm or suicide. Put simply, if you’re feeling low, it’s unlikely that turning to the bottle is going to make things better. Unfortunately, working within the beer industry often makes alcohol misuse a cheap, easily accessible and socially acceptable form of self-medication for stress and other mental health conditions. Tap takeovers, beer festivals, tutored tastings, ‘meet the brewers’ and more all provide ample opportunity to forget about one’s own troubles, effectively normalising a level of alcohol consumption that is both unhealthy and self-destructive in equal measure. In a now (in)famous interview last year, I spoke to Shaun Hill of Hill Farmstead Brewery about his own mental health, and the misuse of alcohol within the beer community. In the interview, Hill admitted using drink to “artificially decompress” after a long and stressful days in the brewhouse, and described his relationship with alcohol as a “vicious cycle” which only served to exacerbate his overall feelings of anxiety, an experience that will sound only too familiar to many of those that work within the industry. Sadly the problem is not just limited to those who make beer themselves. In many cases, people who distribute and sell beer, and the people who work in the bars that buy the finished product all also suffer from similar dependency issues with alcohol, and subsequent strains on their mental wellbeing. 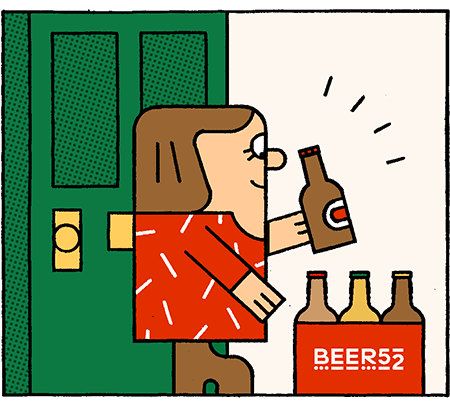 Speaking anonymously, one individual – who has worked for specialist beer venues for nearly five years – describes how the very nature of the craft beer market fosters irresponsible alcohol consumption patterns in those who work within it. “Before I got into the beer industry, I rarely used to drink unless I was going out with friends,” he says. “But because you’re working for a craft beer venue you are supposed to be able to tell customers about the beers you are selling. That takes away any of the stigma that would normally come with excessive consumption. “I would quite happily crack into multiple 7% ABV and up beers after work, despite having to be up and back behind the bar in less than eight hours, and was able to justify it to myself by saying I was just doing my job properly. "I would quite happily crack into multiple 7% ABV and up beers after work, despite having to be up and back behind the bar in less than eight hours"
A large part of the problem within the beer and wider hospitality industry is a lack of knowledge and understanding about the complexity of mental health issues, and their impact in the workplace. The Benevolent is a UK charity that provides practical, emotional and financial support to those who are currently working, or have worked, in the drinks industry and now need help. Last May the charity launched its #NotAlone campaign in an attempt to encourage people in the trade to speak up about their mental health issues, and it has been vocal about the need for wider uptake of its set of recommendations for supporting the industry’s employees. The recommendations include giving employees mental health tool kits in their induction packs, offering flexible working hours and conducting work-related stress assessments. Rebekah Wadham, marketing manager at Thornbridge Brewery, praises the work done by The Benevolent, and argues that mental health awareness and care ought to be an integral part of every employer’s health and safety policy. “When I started working for Thornbridge it was incredibly refreshing that part of my health and safety training was around mental health,” she says. “It’s the first organisation I’ve worked for that has a full Mental Health Policy in place which is part of all training and every employee is expected to adhere to. "I’m not sure as a whole if the industry itself is well equipped to deal with the challenges mental health problems can pose"
For breweries and other employers seeking to improve their mental health support, Wadham recommends the resources offered by organisations such as Time to Change and Mind, and urges employers to create and foster an open environment in which sufferers can speak out without fear of discrimination or repercussions. “Education and understanding is key,” she says. “The more people understand about mental health the better placed they will be to support and help their employees. “Having a Mental Health Policy in place and ensuring it is implemented is also incredibly important. This has enabled me to speak confidently about my own mental health issues knowing I won’t be discriminated against. There are positive signs, then, that the industry is starting to wake up to the threat posed by failing to address mental illness sufficiently. Given the fast paced, often-stressful nature of the profession and the potential for harmful relationships with alcohol to develop, change can’t come soon enough.